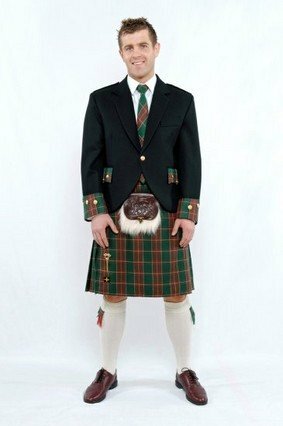 How long have Welsh kilts been around? Some people claim they have been around as long as Scottish kilts, while others would have you believe that they are a modern invention. To be perfectly honest, I don't have the answer to that particular question, as research material on this matter is somewhat thin on the ground. But I do believe that the question has become somewhat Irrelevant, as Welsh kilts are by now very firmly established. The Welsh have even seen fit to spell the word differently, rather than referring to the garment as a kilt, they prefer to call it a cilt. This could well be due to the fact that the letter "k" does not exist in the Welsh language. You can see an example of the Welsh version of the Argyle cilt outfit in the photo below, notice the detail on the cuffs and pocket flaps of the jacket, this use of matching tartan is unique to Welsh cilt outfits. A strong resurgence in Welsh Nationalism has been cited as one of the major reasons for the popularity of the Welsh cilt. There is certainly no doubt that the Welsh nation have a very strong Celtic heritage, (as do many parts of the British Isles), not just Scotland and Ireland. Although the kilt is official national dress only in Scotland, it is gaining huge popularity both in Wales, and with exiled Welshmen around the world. Below you can see a beautiful photo of a young couple dressed to attend a formal occasion, with the young man in full Welsh Cilt regalia. The tartan in this photo is St David's, the design of which was based on a one hundred and fifty year old Welsh tartan. The Welsh National tartan was designed in 1967, to demonstrate the Welsh connection to its Celtic heritage. The colours of the tartan are green red and white, taken from the Welsh National flag. You can see a photo of the National tartan below. As you would expect perhaps, the number of different tartans accredited to the Welsh kilt (sorry cilt) are at this moment fairly small, I have only been able to find thirty eight. 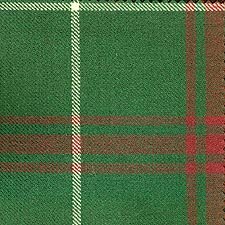 When you compare this to the twenty thousand or so Scottish tartans, then your choice at the moment is fairly limited. Having said that more family tartans are being produced, and some of the more popular Welsh names such as Williams, Jones, Thomas, Evans, and Davies already have tartans. Do these tartans have any historical significance? But that doesn't deter from their popularity, and as I said earlier Wales does have very strong Celtic connections, so why shouldn't they have their own kilt? (and why shouldn't they call it a cilt?). If you have any questions regarding these kilts, or anything else to do with kilts in general, then drop me a line using the "Contact Us" page, and I will be glad to answer them.